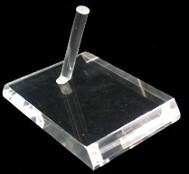 Our clear acrylic lucite stands are great for displaying products or specialty items. In has many uses from store windows to home and office. Bring back to life that collectible that has been stuck at the back of the collection, by putting it on a lucite riser stand. 35 A - 1 3/4" high x 1 3/4" wide x 1 3/4" deep. 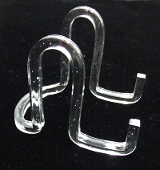 35 B - 2 1/4" high x 2 1/4" wide x 2 1/4" deep. 38 - 3 1/2" high x 3 3/4" wide x 3 1/4" deep. 39 - 4 1/2" high x 4 3/4" wide x 4 1/4" deep. 40 - 5 3/4" high x 5 3/4" wide x 5 1/4" deep. W 2020 - 4 1/2" high x 3 1/4" wide x 5" deep. W 2040 - 6 1/2" high x 5" wide x 7 1/2" deep. GE 3 - 3" high x 2 1/4" wide x 2 1/4" deep. 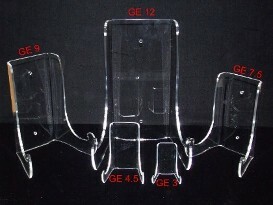 GE 4.5 - 4 1/2" high x 3 1/2" wide x 2 3/4" deep. GE 7.5 - 7 1/2" high x 5 1/2" wide x 4 1/4" deep. GE 9 - 9" high x 6 3/4" wide x 5 1/4" deep. GE 12 - 12" high x 8 1/4" wide x 6 3/4" deep. KG 4.5 - 4 1/2" high x 3 1/4" wide x 4 1/4" deep. KG 6 - 6" high x 3 3/4" wide x 5" deep. SK 2 - 1 3/4" high x 1 3/4" wide x 2 1/2" deep. SK 4 - 4 1/4" high x 3 3/4" wide x 4 1/4" deep. MA 2535 - 2 1/2" high x 3 1/2" wide. MA 3550 - 3 1/2" high x 5" wide. MA 5035 - 5" high x 3 1/2" wide. MA 5070 - 5" high x 7" wide. 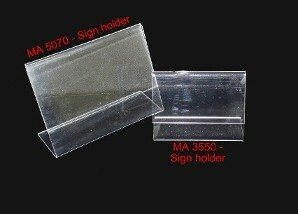 MA 7050 - 7" high x 5" wide. MA 8511 - 8 1/2" high x 11" wide. 005 - 1/2" x 1/2"
01 - 1/2" x 1"
03 - 1" x 1 1/2"
04 - 1" x 2 1/2"
06 - 1 1/4" x 3 1/2"
08 - 1 3/4" x 5"
R 2 - 2" high x 2" wide x 2" deep. R 4 - 4" high x 4" wide x 4" deep. R 2 L - 2" high x 3" wide x 2" deep. R 4 T - 6" high x 4" wide x 4" deep. R 3 S - 1 1/2" high x 3" wide x 3" deep. 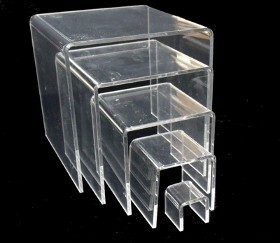 R 4 S - 2" high x 4" wide x 4" deep. 2 - 1P - 8 1/4" high x 7 1/4" wide x 1" deep. 1 - 1P - 14 3/4" high x 8 1/4" wide x 1" deep. 1 - 2P - 14 3/4 high x 8 1/4" wide x 1 1/2" deep. 210 A - 4 1/2" high x 3" wide. DM 1 - 4 1/2" high x 3" wide. DM 2 - 7 1/2" high x 4" wide. DM 3 - 10 1/2" high x 5 1/2" wide. DM 4 - 12" high x 8" wide. 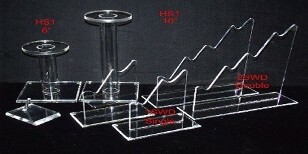 MBL 1 - 7 1/2" x 4" wide with Marble Lucite Stand. CJ 1 W - 6 1/2" high x 6" wide x 4" deep. CJ 2 W - 8 1/2" high x 8" wide x 8" deep. CJ 4 W - 12 1/2" high x 12" wide x 12" deep. CJ 45 W - 18 1/2" high x 12" wide x 12" deep. LRB 9 W - 3 1/2" high x 9" wide x 3 1/2" deep. 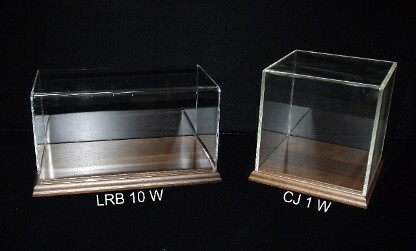 LRB 10 W - 5 1/2" high x 10" wide x 5" deep. LRB 612 W - 6 1/2" high x 12" wide x 6" deep. LRB 816 W - 8 1/2" high x 16" wide x 10" deep. LRB 920 W - 9 1/2" high x 20" wide x 12" deep. 83 1 C - 14 3/4" high x 8 1/4" wide x 1 3/4" deep. 811-1 - 16" high x 15" wide x 2" deep. 815-1 - 30" high x 17 1/2" wide x 3" deep. 91 B - 14" high x 16" wide x 9" deep. 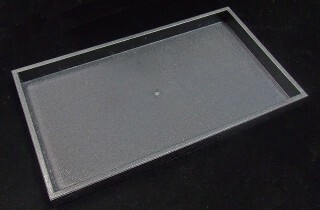 Holds 12 - 260 Riker-type Chipboard Cases.